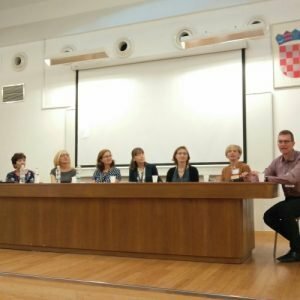 The European Legal English Teacher’s Association’s (EULETA) biennial conference took place 27th-29th September 2018, co-organised by the University of Split, the University of Osijek and EULETA, and was held at the Law Faculty of the University of Split. 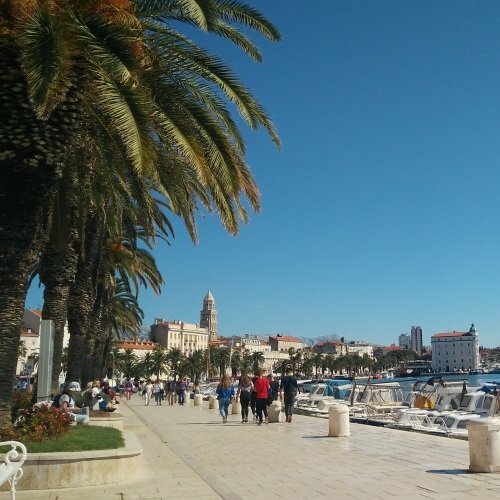 After an intense day 1, where I met lots of interesting people and felt very inspired, day 2 was just as great – a half-day of conference followed by a cultural trip to a local island. Below I detail day 2, read about day 1 here. Day 2 kicked off with a panel discussion ‘Working with content teachers and HR to develop the right Legal English courses for our learners’ chaired by Matt Firth, founding member of EULETA and author of International Legal English, with an all-women panel featuring (from left): Ljubica Kordic (Osijek, HR), Halina Sierocka (Bialystok, PL), Natasha Costello (Paris, FR), Alison Wiebalck (Zurich, CH), Barbora Chovancova (Brno, CZ), Dubravka Papa (Osijek, HR). This is not something that we see that often, and EULETA’s refreshing approach towards gender-equality is also reflected in the new gender-balanced board – comprising of Franz Heidinger, David Best, Mark Brophy, myself (Louise Kulbicki), Sofi Parastatidou and Sophia Barinova. The panellists highlighted that certain difficulties arise when working with content teachers, such as an unwillingness to work together and it’s unclear how to overcome this. 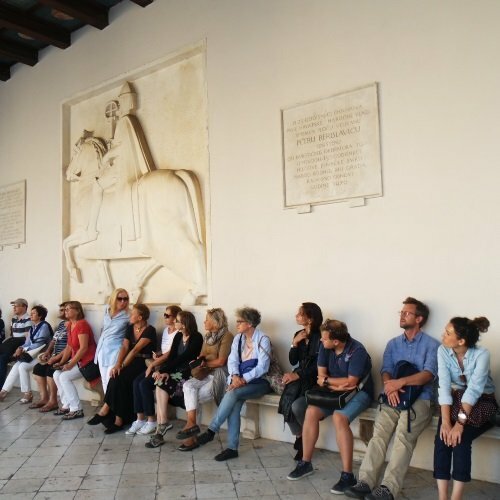 Some other themes which arose were the importance of teaching with a plain English approach, the use of authentic materials and knowing the purpose of the course – for example, is it to prepare students for an ERASMUS year or for their legal career? Having met Halina at the Share & Gain Workshop which she organises, I was really interested in her talk. Halina is an Assistant Professor at the Białystok Centre of Legal English and is very active in the Legal English field – for example, she is an ex-board member of EULETA, has done lots of research into Legal English and is author of some important books Curriculum Development for Legal English Programs and Legal English a textbook for law students. In this session Halina presented a project she has been developing – ‘LEXEN Legal English Course’, for blended learning with Legal English students. She was motivated to do this due to the fact around 60% of the global population now own a mobile phone and many people spend around five hours a day on them. Clearly, online courses can’t be ignored. Halina talked us through the benefits of online learning such as accessibility and student appeal, as well as the complications in designing such a program for example, the software limitations. She showed us her project, which looks like a very well-thought-out, attractive and easy to use interface, presenting interesting content through a range of authentic materials and a variety of tasks. This should be available within the coming months, so stay tuned! 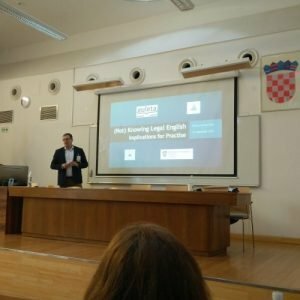 The second keynote speaker, Mr Dalibor Ružić, gave an engaging talk on the problems the ministry faces when translating EU Legal English documents into Croatian, for example – the ambiguity of legal terms and lack of identical concepts across different legal systems, referring specifically to some examples such as ‘social security’. He mentioned that EU Legal English is another form of Legal English which is evolving due to the EU and which contains its own terminology. At the beginning of his talk, Mr Ružić mentioned that he had recently read an article giving tips for keynote speakers, amongst them – be funny or perform an opera. Well, sadly we didn’t experience Mr Ruzic’s hidden opera talents, however, his talk was certainly full of good humour, much appreciated by the participants! 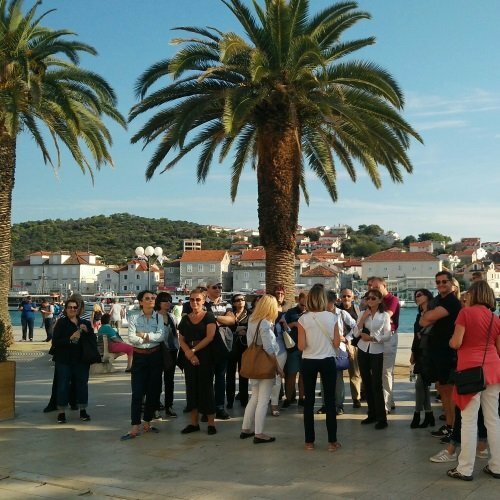 After the conference closed, lunch was followed by a boat trip and tour of Trogir, on the island of Čiovo where we got to sample some local wine and art history. This was brilliant fun and a great ending to a great conference. In conclusion, I really enjoyed this conference. I finally managed to put faces to names I’d heard about, or who I follow on Twitter or am in touch with on LinkedIn. 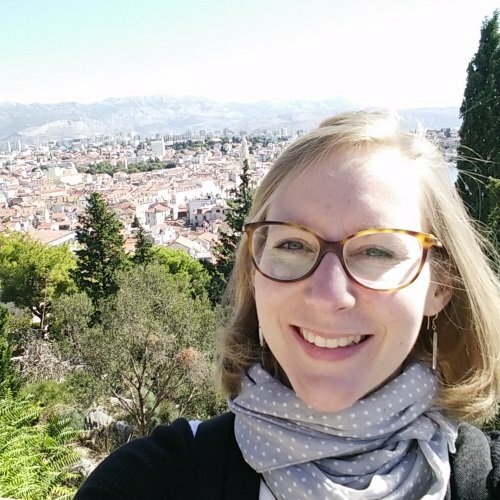 Additionally, I’m really excited about developing EULETA as a newly elected board member in the position of ‘communications officer’ working alongside a great team for its fantastic members.